The traditional churros con chocolate was my poison of the day in this chocolateria known to most as San Churro. 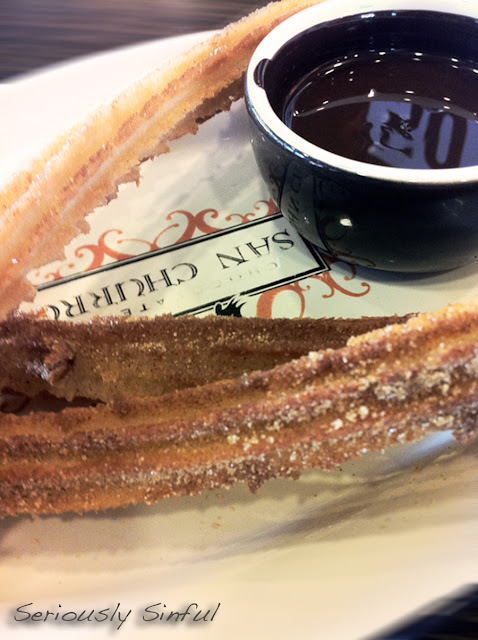 I settled on Churros for One ($7.90) which was served with one dipping sauce of your choice and 3 churros. 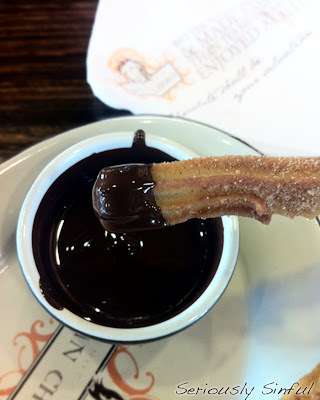 Dipping sauce choices include: White, Milk, Dark Chocolate or Argentinian caramel (dulce de leche). 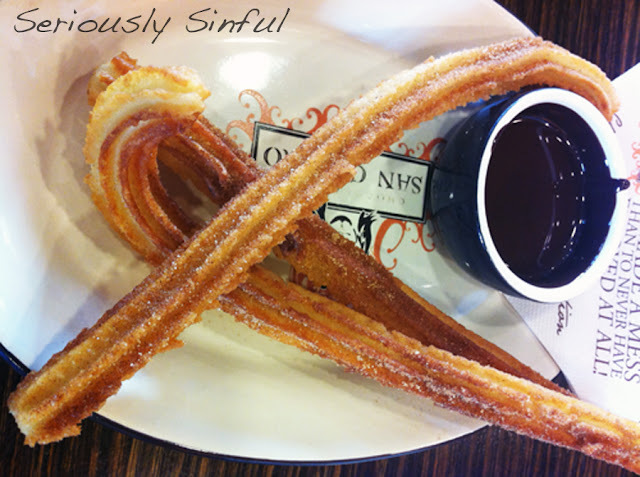 I picked Cinnamon dusted Churros with Dark Chocolate - makes me feel slightly less guilty for indulging since Dark Chocolate contains flavonoids and are full of antioxidants that lower blood pressure and cholesterol. The rain was literally falling in sheets as I sat all snug and warm in this small cafe in Subiaco... perfect chocolate weather, if I say so! The churros arrived relatively quickly (it was an empty time of the day), and I was transported to heaven as this was set before me. Hot air rose from the pastry and I could almost smell the chocolate, it was THAT rich. I personally felt the churros were a little overcooked. They were crunchy, more biscuit like than fluffy. Maybe the Spains like their donuts this way! Still, it was a positive that there wasn't any leftover oil from the flour being deep fried and they didn't employ a heavy hand with the cinnamon sugar. Good grief, the chocolate dipping sauce. I'm not sure what to say, besides the fact that it was warm, rich, decadent and everything one needs a chocolate dipping sauce to be. There was more sauce than churro (to my dismay), but this was definitely a very satisfying treat while cozied up with a novel in the rain. Probably not a regular on my list - it's not cheap(! ), but worth the detour for a guilty treat. Note: San Churro also has stores in Fremantle, Hillarys Boat Harbour, Leederville, Rockingham and Northbridge.